Our team is made up of a motley and dedicated crew of people and canines, but the core team is Drausin and Susan, with Kathy providing invaluable support in production, while Beth and Bob travel to farmers markets as a team. Beth keeps the kitchen going at highest standards, under Susan’s direction, and Bob steps in to help on the farm. Drausin has been the chief-cook-n-bottle-washer since 2008, when he chose to become a full-time grass farmer, leaving his job as a banker to do so. Susan is by-week a country barrister in Batavia, Ohio, providing culinary leadership by weekend. Bo is our border collie, who works cattle as well as sheep. We also employ four Maremma guard-dogs to ward off coyotes. That’s our team – a hearty troop, committed to raising and delivering some of nature’s best food to your table! 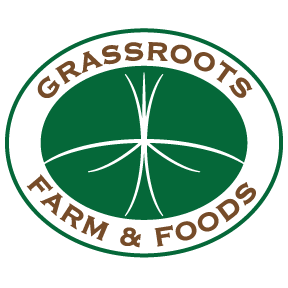 Grassroots Graziers LLC, dba Grassroots Farm & Foods, operates on Red Stone Farm in Cynthiana, Ohio in Pike County. The farm is 85 miles east of Cincinnati and 90 miles south of Columbus. Red Stone Farm has been owned by the John Wulsin family since 1968. Over the first 20 years, Red Stone undertook ventures in barnlot hogs, cow-calf enterprise, stocker cattle, and row crops. In the early 1990s, it made a commitment to support grass-based enterprises to work toward sustainable business practices. Shortly thereafter, a New Zealand-style, seasonal, grass-based dairy was developed on 300 acres. Jersey cows have grazed this “dairy platform” for the past 20 years. In 2008, Red Stone began converting another 200 acres of tillable ground to pasture. This acreage is now leased to Grassroots Farm & Foods, owned by Drausin and Susan Wulsin, to produce grass-based foods. In 2013, all Red Stone fields became "certified organic". In 2015, organic milk was first shipped to Horizon Foods. Over the past 15 years, Red Stone Farm has also been developing a "wetlands mitigation bank" on the property. For more information, see www.redstonefarm.org. Grassroots Graziers LLC is our legal name. We chose it because it describes several important forces underlying the production of grass-fed, nutrient-dense food. First, the food we provide is reliant on abundant and healthy roots of grass plants. Roots of grasses grow when the aboveground portion is not grazed. When a plant is grazed by ruminant animals (cows, sheep, buffalo), roots slough-off, creating organic matter in soil. It is in these soils that the food of our civilization grows. Since we depend on roots of grass for soil that grows our food, “grassroots” stands in our name. The second concept is the word, “grazier”. A grazier manages grazing animals, while a grazer is the animal itself. Graziers orchestrate the interaction between ruminant animals and grass plants, to create rich soils that produce grass-fed meats and milk. One must become a skilled grazier to produce high quality, grass-fed food, and thus we include that word in our name as well. Our logo depicts a grass plant both above and below the surface of the soil. We aim for more roots to exist below the surface than blades of grass above it. When we supplement this plant with free solar energy to catalyze it, ruminant animals to harvest it, and customers who value the food it generates, we have the making of a sustainable business model. The grass plant thus lies at the heart of our sustainability. We are proud to be graziers managing southern Ohio’s grassroots to produce healthy food from our farm for discerning customers. Hence, we employ the marketing name of Grassroots Farm & Foods to promote and deliver the product to you. Managing land holistically and stewarding grass-fed animals. Preparing nutritious, savory, convenient, and trustworthy foods. Delivering grass-fed beef, lamb, and other foods to families in neighborhoods within 100 miles, to include Cincinnati, Dayton, and Columbus, Ohio. This production system is solar-powered: the sun fuels growth of perennial grasses year after year to be harvested by ruminant animals. This form of production can be replicated and expanded without exhausting natural resources. Nature has perfected this model over the millennia, producing wild herds of grazers, numbering in the tens of millions, in North America, Africa, and Asia. We are emulating this model on our landbase. Nobody influences our thinking more than Allan Savory. Making daily decisions on a farm that incorporates the fast-changing variables of people, land, animals, weather, markets, and money can be confounding to say the least. In order to maintain clear minds and steady emotions as we wrestle with these variables, we find guidance in the decision-making process articulated by Allan Savory in his seminal work, “Holistic Management - A New Framework for Decision Making.” More information can be found at www.savoryinstitute.com. We also stand by the principles of “slow money” articulated by Woody Tasch in “Inquiries into the Nature of Slow Money.” Slow money places value on the benefits of economic activity beyond the standard rate of return on investment. Specific benefits emphasized are nonviolence and beauty. We believe grass-based food production achieves both financial and spiritual returns in a magnificent way. We are devotees of Wendell Berry – the Kentucky poet, philosopher, and farmer – who articulates eloquently the conundrums and opportunities faced by contemporary agriculture. He is a clear advocate of ecological rates of return, nonviolence, beauty, and affection, as cornerstones of economic activity. Joel Salatin is a forceful voice for the production and marketing of grass-based foods. His neighborhood-marketing strategy, through Metropolitan Buyers Clubs, is a successful approach to developing a relationship-based business. We are grateful to him for his tireless example and inspiration. We care deeply about the land we manage, the animals we steward, the food we produce, and the customers we serve. It is a privilege to be forging links in this chain of connection.